If you're not planning a day at Disneyland, you might want to give the kids a bit of a treat at Disney’s El Capitan Theatre, located just across the street from the Chinese Theatre and Hollywood & Highland in Hollywood. Seeing a movie at El Capitan Theatre takes you back to the days when visiting a movie palace was as much about the palace as the movie. With its Spanish Colonial exterior and ornate East Indian interior, lovingly restored by the Walt Disney Company, the El Capitan is a treat for the eyes before the film ever starts. El Capitan is not the place to go if you plan to rush in during the trailers and find a seat in the dark. That would be missing the point. You take the kids to El Capitan to see Disney’s pre-movie stage show, which might include singing and dancing movie characters from the film you are about to see, or stunt tricks or special effects, but always starts with pre-show music on the 1920s “Mighty Wurlitzer” organ. The elaborately carved golden instrument has four keyboards with 37 ranks of pipes placed around the theatre. 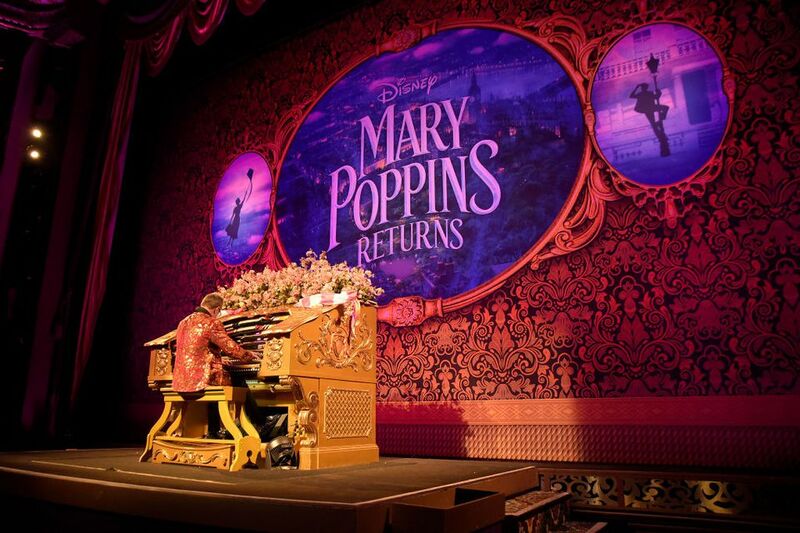 Although El Capitan is usually showing the latest Disney feature, keep an eye out for sing-alongs with movies from Mary Poppins to Frozen, or classic Disney films shown on Throwback Thursdays. Originally constructed in 1926 to host live theatre productions, El Capitan was remodeled and converted to a movie house in the 1940s and renamed the Hollywood Paramount. In 1989, the Walt Disney Company and Pacific Theatres teamed up to restore the theatre to its original grandeur. El Capitan screens exclusively Disney films, so a large number of them are G-rated and appropriate for children of all ages. You can purchase VIP seating, which covers the center orchestra seats and center balcony per seat for adults and children at all shows, which you may consider a lot of money for a movie, even with a song and dance number thrown in. General Admission reserved tickets are a bargain compared to other movie theatres on Hollywood Blvd. These are seats on the side of the theatre on the main floor and the balcony which have a perfectly good view of the stage and screen. Tickets can be purchased online or at the box office. Shows do sell out in advance so it's best to check the website ​elcapitantheatre.com or call 1-800-DISNEY6 for ticket availability. Goldstar sometimes has discount tickets to El Capitan. For an additional treat, take the kids to the Ghirardelli Soda Fountain and Disney Studio Store in the same building for ice cream and a Mickey Mouse PB&J sandwich. El Capitan Theatre now offers public tours. The 30-minute tour before the first screening every day includes the theatre, backstage, and public areas. the 15-minute tours throughout the day only include the front of house lobby areas and lounge. As is common in the travel industry, the writer was provided with complimentary tickets for the purpose of reviewing the venue. While it has not influenced this review, About.com believes in full disclosure of all potential conflicts of interest. For more information, see our ethics policy.